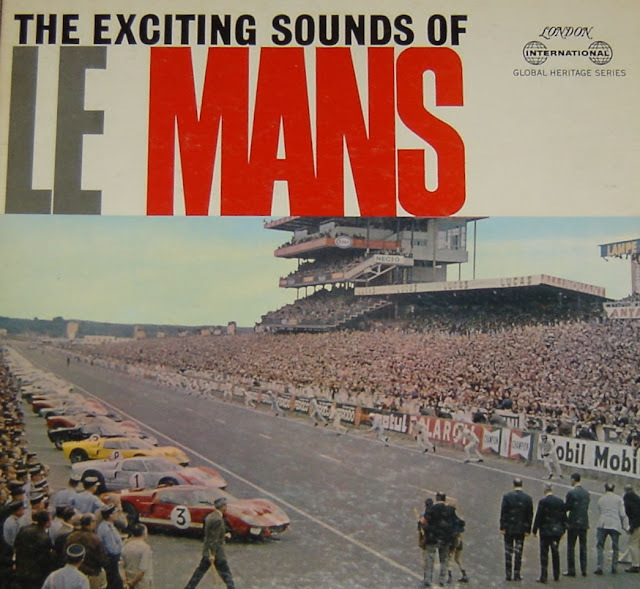 In the age of instant everything it's hard to imagine experiencing the 24 Heures du Mans on a vinyl LP yet, in 1967 that was as close as an enthusiast could get get without traveling to northern France. The 84th edition of the 24 hours of Le Mans will take place this week end and will be broadcast and streamed in real time to the whole planet but take a moment to travel back to another, simpler time. "The Mulsanne Straight at night - In the distance a 7-Litre Ford prototype is heard at 210 miles an hour. As it roars past on its way to the sharp right-hander at Mulsanne Village another is heard hurtling up from the left and slowing down for the turn. In their wake the pack follows: the fiery red Ferraris of Italy, the long-tailed Porsches from Germany, the vivid blue Alpines from France. As the cars from eight countries devour the night, the commentary sets the scene for this greatest race of all." "The preparation - At the beginning of the week cars and mechanics arrive in Le Mans and settle into the host of garages scattered around the ancient city. Favourites to win the race outright are Ferrari - lurking in the former municipal slaughter-house - and Ford, who have set up a sort of miniature racing car factory in the big Peugeot garage on the outskirts. Will Ford be the first American car to win the race? After 34 years, in which Britain, France, Italy and Germany have shared the spoils, and the United States has tried so hard with her Stutz, her Chrysler and her Cunningham, at least it seems possible for Ford to take the outright prize across the Atlantic. Carroll Shelby, entrant of three of the Fords, and himself a former winning driver in 1959 at the wheel of an Aston Martin, is optimistic as he talks in the garage." "Practice session - practice on Wednesday evening shows the true form of the cars. Or does it? Ford, Ferrari and the lone Chaparral from Texas vie with each other for fastest lap (eventually secured by Dan Gurney in a Ford) for no other reason than to frighten the opposition... (this was recorded at Mulsanne Corner before heading back to the all-night work on the cars in their garages)"
"Prelude to the start - the period before the start of Les Vingt-Quatre Heures Du Mans is charged with spectacle and with noise. This on-the-spot recording made at the top of the pits captures the marching band and the hysterical French commentary." "Last minutes to the start - captures the atmosphere as the tension builds and you hear the nervous blipping of engines." "Graham Hill talks about the start - we hear what it is like to be a driver, standing across the road waiting for the flag to drop and send fifty-odd men running to their cars." "The start - the last seconds are counted out, and there is a roar from the crowd quickly drowned by the roar of engines." "The opening lap with Graham Hill - we are taken around the circuit with Hill, on which he led the field." "The Esses at dusk - here at the Esses near Tertre Rouge we hear the English public address commentator give the race order at 8pm. This is a fast left-and-right corner with high banks on either side of the road. It is here that the romance of Le Mans by night first strikes you, as headlamps pierce the evening shade - and the long, lonely night of endurance lies ahead." "The Mulsanne Straight and Cafe des Hunaudieres - as cars roar past at up to 200 miles per hour a farmer watches his 30th race - until after a brief lull, the sound of his dog calls him home to a good peasant's supper. We then walk up to the Cafe des Hunaudieres, and sit behind the straw bales to drink an aperitif within feet of the cars." "Mulsanne Corner and the Signalling Pits - as we sit on the balcony of the Golf Club - the noisiest 19th hole in the world - we can hear the cars decelerate from 200 miles an hour to little over 30 to 'potter around the corner' as Graham Hill puts it. Hill then takes us to the signalling pits to explain what the signals are about, and why they are sited here. Mortimer Morris Goodall - in charge of signalling - relays the message to Dan Gurney on the Ford No.3." "The Fairground and the Esses - here we are at the fairground at 10.30 pm - the noise of a carnival which doesn't stop for two days and a night. With it's Wall of Death and strip-tease booths, it's dodgem cars and rifle ranges, this is like Coney Island or Blackpool with a tang of garlic. We hear the race order at 10 o'clock, the weird comments of the public, the Swedish girl and the Romanian girl selling the New York papers.... and then we walk towards the track-side. Graham Hill retires, and we listen to his own account of what happened." "The pits at 3.30 am - with Graham Hill we visit the Shelby pit and hear Bruce McLaren hand over Ford No.2 to Chris Amon. McLaren warns Amon of the few snags to look out for on the circuit, the car roars away, and Hill takes us up to the Porsche re-fuelling stop. With military precision the German mechanics count out the fuel, and in the distance the public address commentator gives us the race order." "Sunday morning - as the crowds wake up, Mass is celebrated near the Esses - with a topical address in French, German and English." "At Arnage the crowd clusters round the loudspeaker for a new race order at 10.32 - and Bruce McLaren and Chris Amon recall the story of the air-duct which nearly caused a nasty disagreement. But for these two drivers there are worse dramas, described by Amon as he tells us what a race like this can do to a car. The crowd begun to get big again as the day creeps on, but while rain turns the road into a skating rink, they talk of anything but the race." "The long haul to victory - as the surviving cars drive cautiously round and the clock nears 4, comes the final dramatic story of Ford's intended dead-heat, told by Chris Amon, and at last while the crowds cheer, the two Fords cross the finishing line - to be greeted by a splendid piece of French logic which made McLaren and Amon the winners, Miles and Hume the runners-up - and the English public address man hysterical with emotion."